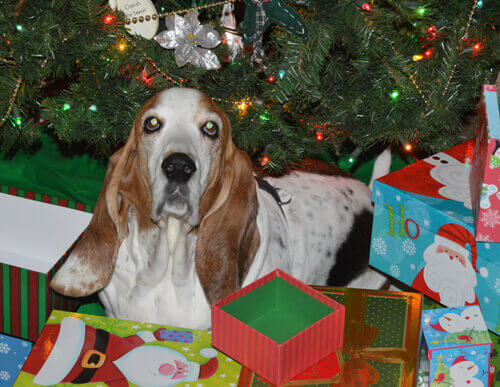 The holidays can be busy time for us all, and that can create some stress in our dogs and cats. The stressors to our pets may come not only from additional visitors, but also the changes to regular routines and schedules as we are busy with parties, school events, or travel. We may recognize obvious signs of pet stress such as whining, refusal to eat or destructive behaviors yet there are many more subtle signs of stress that take a toll on a pet. There are ways to reduce stress, but let’s first be sure we are recognizing what our dogs and cats are telling us. The earlier stress is recognized, the earlier you can take steps to decrease that stress for your dog or cat. The posters below from Dr. Sophia Yin are the best way to recognize the brewing stress in pets. We have these posters available at our office or you can download a copy from the drsophiayin.com website. 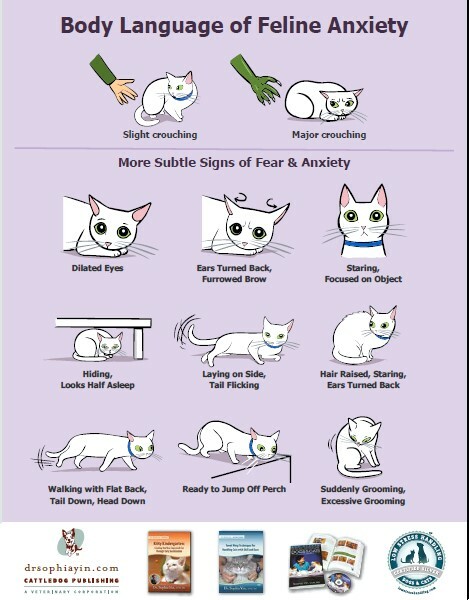 These are the best to help recognize when our pets are first getting stressed out. I like to keep these clipped up on my refrigerator to remind my family and myself what early stress looks like. So now that you know your pet is getting stressed, what to do? Stress is managed – and that is by identifying what actions, persons or other animals, noises, or changes in routine have the animal feel there is a threat to what has them feel secure. In short, there is a low level threat or uncertainty for the animal so they are feeling stressed. If you know your dog starts pacing more, refuses to eat or has that “worried” look all the time when your sister and brother in law visit, it is likely the additional people in the home that has the dog stressed. It may be some elements of the people that get this dog upset – maybe your brother in law has a really loud laugh – maybe you and your sister argue over how to make mom’s traditional green bean casserole and that is when your dog slinks away, hiding behind the couch. Think about what is happening or observe what is happening when your dog looks this way and that will tell you what the trigger is. Now that you have an idea about the triggers the first way to manage it is to not allow these triggers to happen around your dog. Changing people is difficult – changing the environment for the dog is easy. Calming music and their own bed to lay on. Take your dog on a long walk – exercise is an excellent stress reducer for yourself and your dog. If your dog is stressed the entire time, consider boarding your dog. As long as boarding is not more stress than the visitors that can be a good option. For many dogs, they are helped with some of the supplements and pheromones that help reduce stress. Keeping to routines such as feeding at the same time daily, taking them out for their walks or play on the same schedule and playing music while you are gone to reduce separation anxiety is important. Walks off your property are really helpful to keep the mind calm and give them enrichment during busy times when there is so much going on. 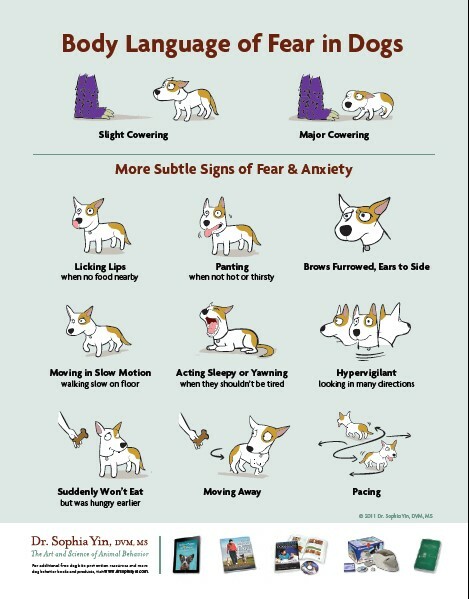 If there is a visitor dog, it is extremely important to watch for these signs of anxiety. Often they are missed and the dogs are stressed around each other leading to fights which can ruin everyone’s holiday. Be sure to feed the dogs in separate areas, removing all bowls. Toys should be given for limited time and supervised that dogs do not swap or take toys from each other. Lastly, keep the dogs away from the kitchen and dining areas. I have seen where the dogs are hovering around, waiting for dropped food and when that happens they both go after it and end up with a scuffle. Cats do experience stress during the holidays, although their signs are typically more subtle as compared to dogs. It is still important to recognize that early stress and help our cats be less disrupted by the holidays. Cats do have their routines – so maintaining feeding times, play times and keeping the litter box clean are very important. Few cats get enough play – taking a ball or feather toy to have the human play with the cat at least 10 minutes a day can do a lot of good for the cat mentally and physically. For cats, any new person or item in the home is like a space invader. The cat needs to feel like they have marked on this person or object with the scent glands in their head to accept this item or person as part of their home. Cats have to rub on the furniture and people in the home every 3 days to keep this scent fresh. That is why when you come home from a long trip your cat may be tentative about rubbing up on you – they look at you like “who are you” because they can tell you do not have their scent on you. Reducing holiday stress for the cat is to use the feline marking pheromone Feliway on the furniture, suitcases and on the hands, feet and legs of people who are visiting. This will help the cat feel like they have met this person before, or that these objects must be a part of the home. That helps reduce stress. Noise and movement are also triggers for cat’s to feel threatened. So active people – young children- or loud people will often have the cat choose to stay under the bed or perching way up high to stay away. This is hiding in the cat, and while they are less upset here than out with all the action, it can also result in holding urine or not eating leading to health problems. Be sure to provide a litter box or food in a cat room where people cannot bother your cat as part of a holiday stress plan. For our cats who are hiding all day, they need stress reduction. Talk to your veterinarian about supplements, pheromones and other plans to reduces stress. Some cats do well boarding, but most do best to have a cat room all set up for them at home that people will leave them alone in. Then the owner can go in the room to visit and play with their cat. It may be a stress reducer for you too to get away from all the guests! If these tips do no help your pet enough, please call our office at 217-253-3221 to set up a consult. 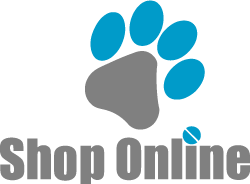 We have helped many pets have a much better holiday season by identifying all the elements that were creating the stress and providing a customized plan to improve the behavior. Click on below photos for a larger version.